22 Jun 2017- Applus+ K2 is pleased to announce the launch of its Global Wind Organisation (GWO) accredited basic safety training for wind turbines. 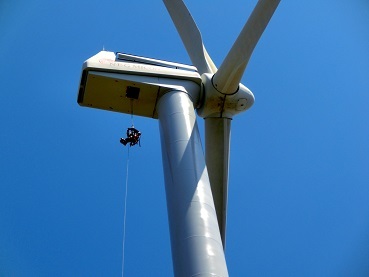 The training course provides attendees with the basic skills that will enable them to work in a safe manner in the wind industry and to meet emergency response requirements. 14Feb2017- Applus+K2 competency training department have developed its Wire Rope Inspection course in line with our new wire rope inspection service offering.The Emag wire rope inspection system is specialized technology and very specific training is required that is not available in the usual NDT training facilities.For this reason Applus+K2 decided that a bespoke training course was required to ensure that all personnel involved in this service would be competent for the task. 20 Jan 2017 - Applus+K2 would like to introduce our new training,IECEx (CoPC) training, which is designed in accordance with IEC 60079 standards. The IECEx(CoPC) training is one of the vital training courses for people who work in a place where there is possibility, however small, that an explosive atmosphere may be present. This demands that appropriate work methods and equipment are used to ensure compliance with the standards and legislation, specifically designed for this purpose. Applus+K2 is pleased to announce that they are now an IOSH accredited training provider of IOSH managing safely training. This training aims to improve the competence and professional standing of the learners through interactive and innovative adult learning concepts. 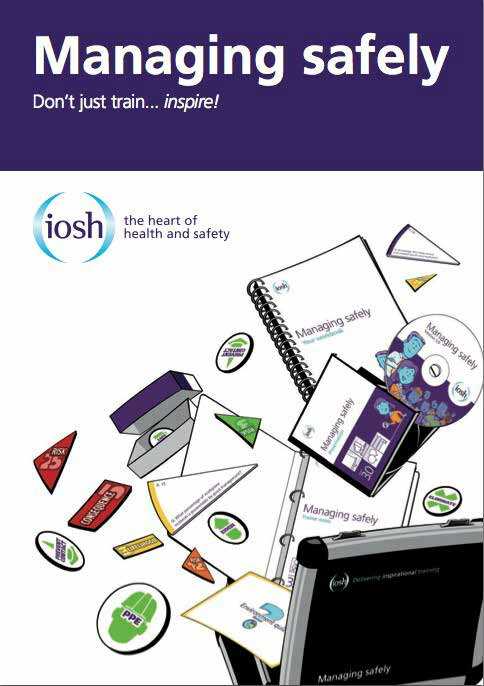 The IOSH managing safely training is designed for managers and supervisors in any sector and for those who plan to be managers or supervisors in the near future. The students will get up-to-speed on the practical actions they need to take and gain the knowledge and tools to tackle safety and health issues they are responsible for. 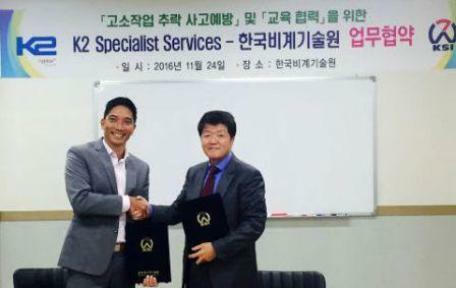 Applus+K2 recently signed an MOU with the Korea Scaffolding Institution to promote specialized technology, training and certification services for rope access. "We made this agreement with Applus+K2 to mitigate the risk of falling. We also hope to reduce the time and expense of mobilizing large equipment and manpower to perform welding, painting and repair work at height. We will actively contribute to promote this advanced technology in order to prevent work at height accidents.” said Hong Gi Choel, Director of the Korea Scaffolding Institution. 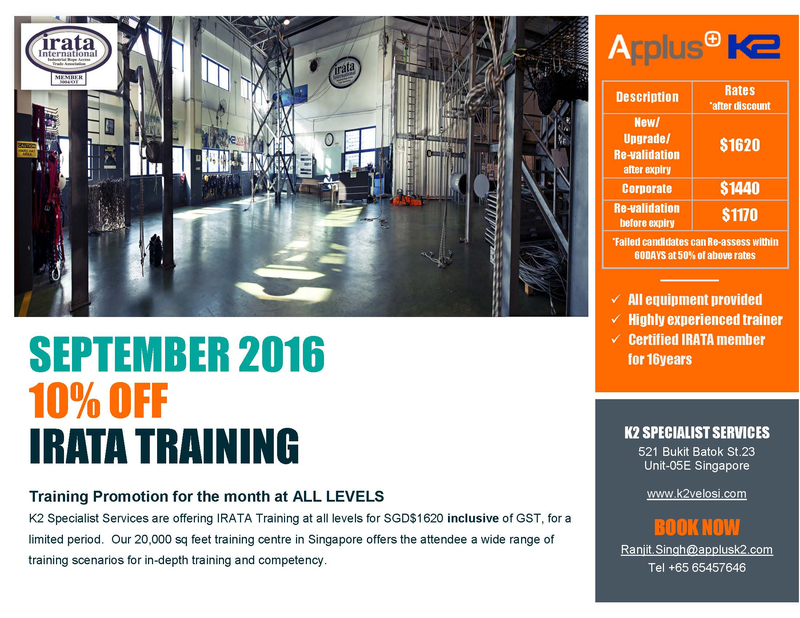 K2 Specialist Services are offering 10% off IRATA Training for a limited period. 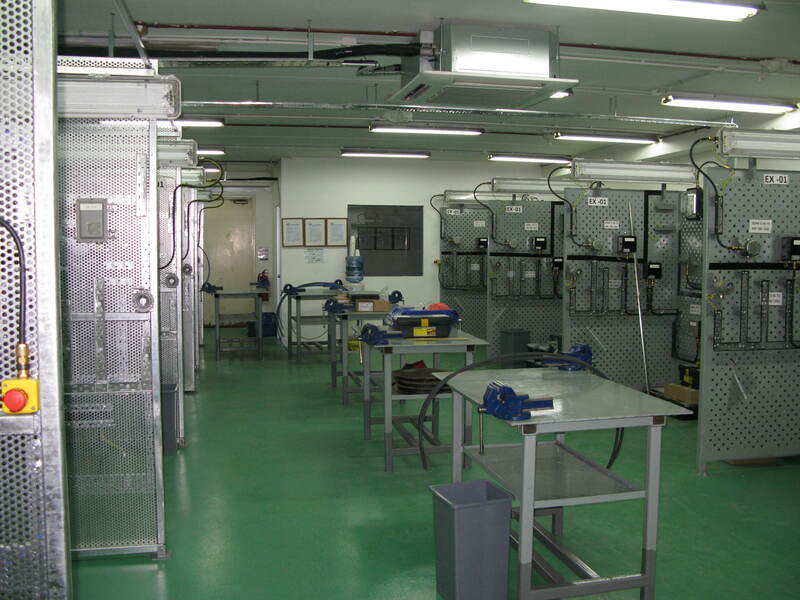 We offer new entry, re-validation & upgrades for all IRATA levels at our 20,000 sq feet training centre in Singapore. As a certified full member, Operator and Trainer of IRATA, K2 is able to provide the attendee a wide range of training scenarios for in-depth training and competency. All equipment will be supplied during the course and the attendees will receive a comprehensive training manual which will be an excellent reference for their career in rope access. If you wish to take advantage of this limited offer, contact us at +65 6545 7646. K2 America would like to announce the arrival of K2's Drops Training Simulator which was used to conduct a staff roll out. 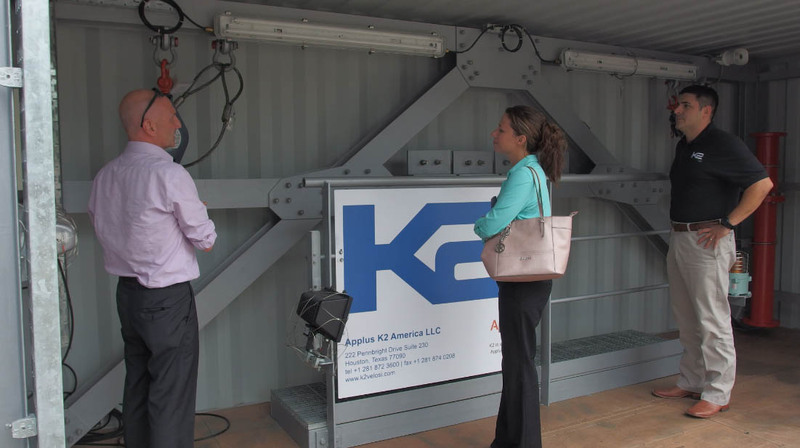 K2 America also presented this latest product line to several Operators and Drilling Contractors at their Houston Office. Great feedback was received from both Operators and Drillers that included a request to provide this Drops Training service to one of the major operators in the Gulf of Mexico to begin in 2016. “K2 has been working closely with one of our valued customers to help in the development of a drops program that will help manage their asset as well as keep their team members safe, we have developed a customized program for them and look forward to seeing the results in the near future” says Victor Castro, Business Development Manager-K2 Americas. 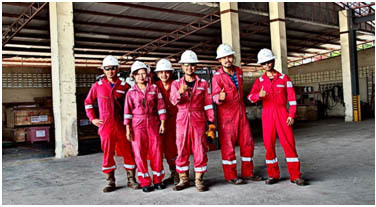 K2 Training Department has secured further training with Shell in Brunei for the remainder of 2015 & early 2016. The development of this course was completed early 2015 with the assistance of K2’s Competency Department and Shell Petroleum, Brunei. The course was specifically designed for Shell and has been approved by IADC. 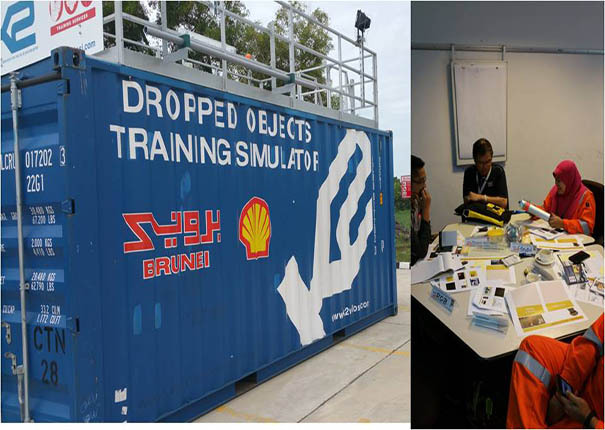 The training focuses on Shell policies, procedures and specific requirements to address Dropped Objects for their drilling operations. Shell’s commitment to K2 and the delivery of this training is good news and the relationship is growing with additional Shell locations requesting the training. K2’s Training Department are also working closely with the GM from Wells Qatar and New Zealand to secure training projects to take them to the end of 2016. Contracts are expected during October 2015. 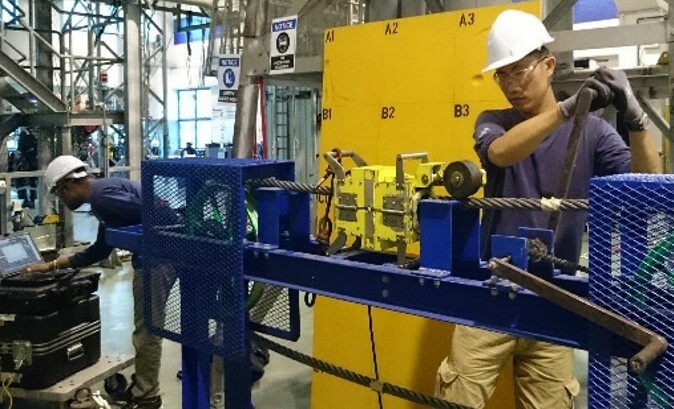 K2's Dropped Objects Training Simulator was successfully shipped from Miri, Malaysia to Songkhla, Thailand last September to continue K2's Drops Training for SKD. Sixteen courses will be delivered for up to 160 Rig Crews and will be conducted in English with a Thai translator. "Dropped Objects is a key subject for many companies and is receiving high priorities for training and certification. Drops training is important to SKD in setting new policies for their drilling operations. This project is considered one of the most challenging training course for K2's instructors. They have to ensure that "communication and time will not be a barrier for an effective and successful course" says Kevin Monaghan, K2 Group Training Manager. K2 Competency department has rolled out a Workplace Competence Assurance Programme. The competence standard has been developed in line with K2's inspection services such as Dropped Objects Inspection, Lifting Gear Inspection and Drilling Handling Tools Inspection. The performance criteria and competency evidence are defined by K2's dedicated inspection department personnel. Inspectors will be assessed against such criteria in a controlled and consistent manner. They are expected to meet these standards to be competent. K2 Competence Management system keeps track of all the personnel competency records. If competency is deemed to be lacking, personnel will be sent to attain the required knowledge and/or experience via training and/or relevant forms of developement. K2 Specialist Services agreed on a significant contract with major drilling contractor SapuraKencana Drilling (SKD) this April with 36 Dropped Object for Rig Crew courses agreed over the space of four months.SKD crews from 5 rigs in Malaysian waters and 6 rigs in Thai waters are expected to receive specialist training in the high profile DROPs arena in the coming weeks. In addition, 2 crews from Trinidad are scheduled to arrive in the K2 Houston office as soon as the custom designed DROPs container is delivered in the coming weeks. K2 Singapore is proud to announce the approval of the new CompEx Training facility. The audit was conducted by JTLimited UK covering Ex01-EX04. The global reputation of K2’s training department paid dividends in 2013 with 5,631 trainees last year, of which over 5000 were external personnel. The department showed 55% increase in revenue over the year. K2 Specialist Services received two Certificate of Accreditation from the International Association of Drilling Contractors (IADC) on 30th September for course design specific to Dropped Object (DROPS) Inspector Training. The certificates, which award conditional IADC Drilling Industry Training Accreditation, were for the K2 DROPS Inspection Training course developed in-house earlier this year, and the Transocean DROPS Inspection Training course design developed this May. Kevin Monaghan, K2 Group Training Manager, contributed the following article to the September issue of Offshore Safety Asia. In it he gives an interesting perspective on confined space training on and offshore for the oil and gas industry.